Homegrown Hearts » Blog Archive » The pitter pat of little…paws? The pitter pat of little…paws? Do rabbits have paws or feet? I think paws. Anyway, as promised, I am happy to introduce you to the happy tenant of the rabbit hutch I built. Isn’t he cute?!? I should probably explain his name. Or maybe I should just show you. See the smudge on his side/back? He has one on his tummy and another little one on his nose. Thus his name. We’re simple folk. Oh, and my other suggestions were turned down for one reason or another. 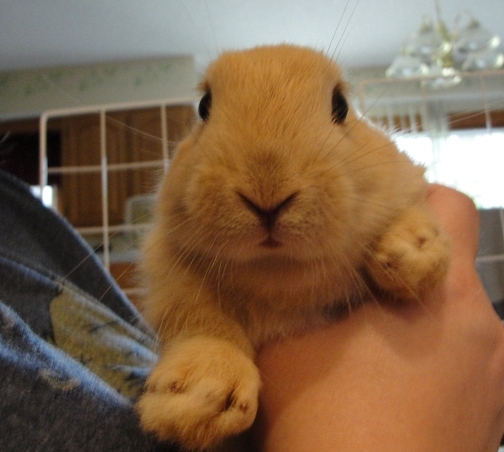 Atilla the Bun…hubby didn’t want to memorialize an evil person. 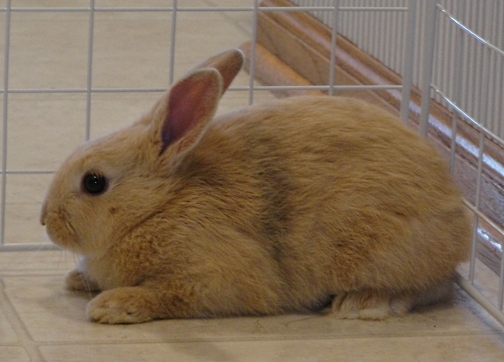 Herbie the Love Bun…my kids liked it okay but they weren’t LOVING it. So Smudge it is. Unless we change our minds. I don’t think the rabbit cares one way or the other. So that’s the newest member of our zoo! He really likes hearts of Romaine lettuce along with heirloom black-seed lettuce and spinach from my garden. I hope my husband wasn’t counting on getting to eat those. He also likes dandelions a LOT. But our yard has been treated for weeds now, so no more fresh ones for him for awhile. I don’t really want to feed him herbicide. He also likes playing with his whiffle ball. He rolls it around in his cage, it’s so cute. Oh, and of course he loves his cage! I mean, who wouldn’t?